Encyclopedia contains attributes and abilities of the vehicles included in the game. To select a vehicle, choose a slot to put it in: . Then select the vehicle from the list. You can apply a vehicle type filter: . To free up a slot right-click on it. There are 4 slots available. To show and compare vehicles specifications select the vehicles of the same type and click the button. 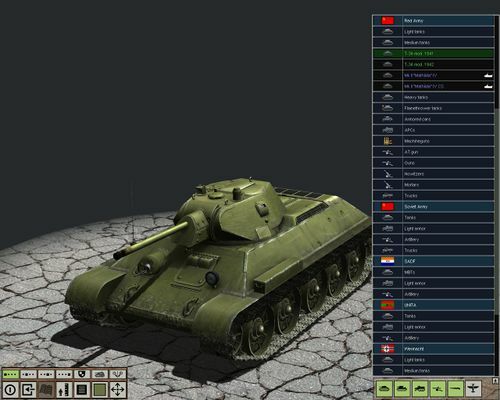 The comparison table will show years of production and service, numbers produced, armor values, weapons and armament, crew size, engine type and performance. To view armor penetration diagrams click one of the buttons: . You can change the camouflage using the button, it shows the currently selected camouflage. Its variations: . The button will show the height reference near a vehicle. This page was last edited on 24 February 2014, at 23:00.